n the lead-up to the Federal Election, the women at Belgrave roundabout have begun lobbying in Lilydale. 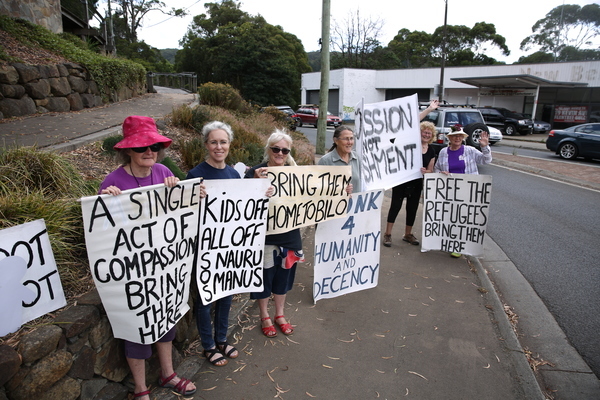 Since November 2017 a small group of local women have congregated at the Belgrave roundabout with signs which say ‘Honk for Humanity,’ ‘Bring them Here,’ ‘Justice 4 Refugees,’ ‘Shut Down Manus and Nauru,’ and ‘Kids Off All Off’. The group was created in response to the Manus siege in 2017 when Manus Island was decommissioned, leaving many refugees without a place to stay. In the lead-up to the Federal Election, those women are ramping up their efforts and have now begun lobbying in Lilydale. Prue Licht, a Belgrave resident and a retired social worker told the Mail that that the response from public, particularly in Belgrave has been largely positive. We’ve counted toots and waves ever since we’ve started and they’ve gradually gone up and in Belgrave they’ve gone up to 537 last weekend- that’s the highest it’s ever been, so obviously there’s a lot of support. “Everyone’s been hugely supportive,” Prue said. Everyone it seems, except the federal members. To emphasise their message many of the women have set up at the corner of Anderson and Maroondah Highway in Lilydale – which is closer to the centre of the Casey electorate. Prue Licht said that if the government fails to address the issue at the next election, it’s likely that the group will continue to protest. Would not wish that scenario on anyone. I do however believe in border control. Could you imagine what would happen if we didn’t have it? These people are a few amongst many around the globe that deserve better lives. They should follow the process like everyone else has to do. What makes any one of them more entitled than another?